The palm has many prominent lines that tell volumes about us and the kind of life that we will live. One such line is the marriage line. We will now discuss a little more on the marriage line on palm. It can be located just below the little finger. It is a vertical line and they can be either one or multiple in number. The more numbers of marriage lines mean that the person will have many brief relationships. I am sure you must have located the marriage line by now. For men you should read the right palm and for women the left palm is taken into consideration. If the line is long and deep that means one will have a long and happy married life. If the line is short and broken tha means there will be trouble in the marriage. Above the marriage line you will notice vertical lines that indicate the number of children that will be born to the couple. If there is any cross on this line then it may mean a divorce. If the marriage line is closer to the little finger that mean the person will marry late. Sometime the marriage line ends in a fork like shape this means that there are greater chances of love marriage. The length of the line says how well you will be in love with each other. A steady and straight marriage line indicates a good a solid marriage. A marriage line that bends towards the heart line shows the there will a heart break in the marriage. This also means that the person will not be happy post marriage. Sometime you may notice that a black spot forms on the marriage line. This is not a good sign and you must visit your astrologer fast. If your marriage is going through a rough phase then you must consider visiting an astrologer as they can read your palm and suggest you remedies. When there are too many marriage lines then it means the person will get into many marriages but the strongest of them will last. There are some palms where the marriage line is very light as a result these people will find it difficult to get married. They will always face some problems. Some people have equally strong marriage lines running parallel to each other that mean these people will have a number of affairs with their marriage. The marriage line on palm is so significant that the experts can even say which of the partner will die first and how the marriage will be. We must mention a very important fact here and that is marriage is also dependent on your natal chart so ensure that you make a proper horoscope before you consult a palmist. Both palm and horoscopes together can give the best idea of how the marriage will be. Sometime you will notice that the marriage line on palm starts like a fork and then ends in a strong line. This means that the person will marry someone he or she knows for a long time. If the line ends in a fork like shape then it might mean that the marriage will end in a divorce or by death. The line can also say how will be the influence of the marriage on their career and health. 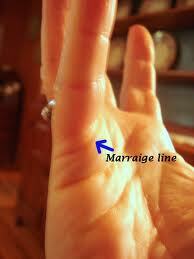 Marriage line on palm is a common line. Many people take it as a good time pass and try to read it. Well if you look at it from astrological point of view this is a very important line and must be treated with great importance. The marriage line on palm can change with time and the karma of the person. You must see to it that you consult an astrologer before you get married. This will help you decide what the situation of your palm is like and when you should get married. Don’t try to analyse the marriage line on palm yourself. The line is a complex one and had many points that you must consider. I would suggest that you visit an astrologer and consult him or her if you really want to understand your marriage life better.